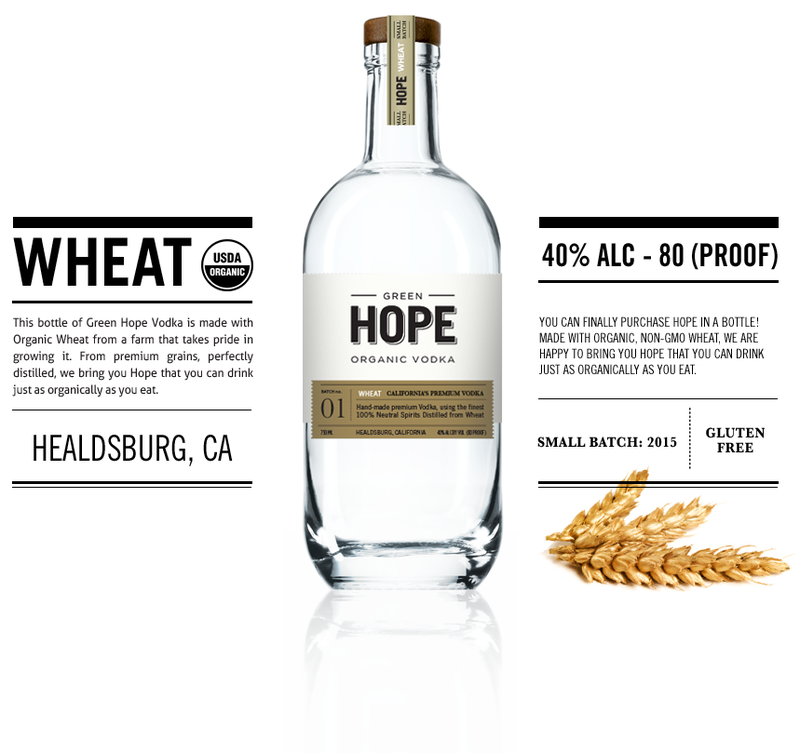 Green Hope Organic Vodka – Organic. Gluten-Free. California Local. Small Batch. At Green Hope, we believe in a little something we like to call “sustainable sipping.” We believe that you can’t make the best drink on earth if you aren’t using the best ingredients on earth. From premium grains, perfectly distilled, we bring you Hope that you can drink just as organically as you can eat. This is why we made it our mission to produce clean, organic, non-GMO spirits that you can feel good about drinking. Inspired by fresh ingredients and crafted by hand, Hope Vodka is viably sourced from USDA certified organic family farms. 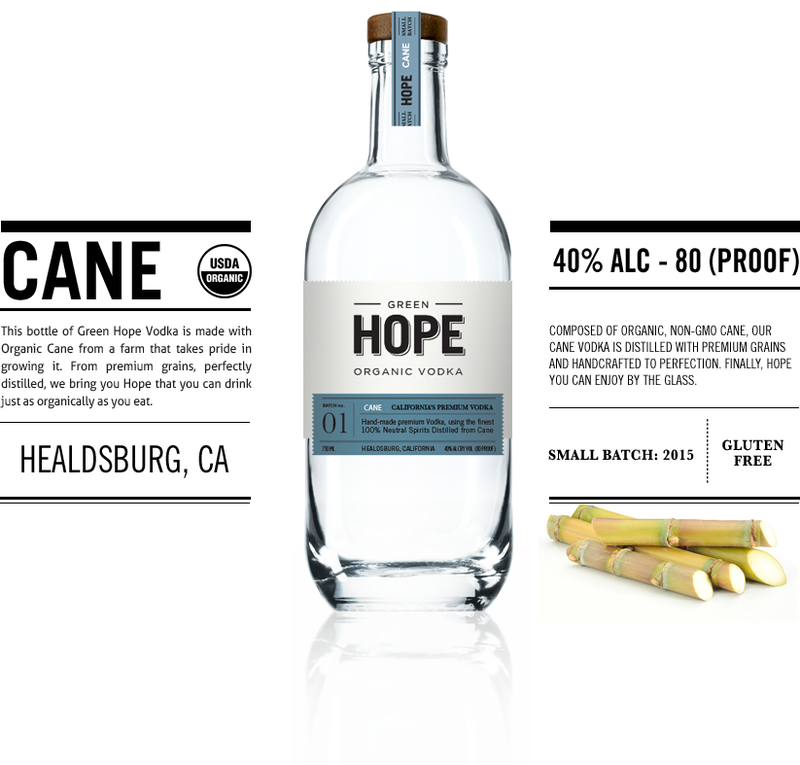 Each time you sip on a cocktail infused with Hope Vodka, you are also helping to support the growth of organic farming in the United States- as we donate 1% of total sales to the California Certified Organic Farming Foundation. When you take a sip on a perfect Hope and Soda, mix up an Organic Bloody Mary, or squeeze a fresh ruby red grapefruit into an epic greyhound it becomes clear you are drinking something you can feel good about. So, what do you say? Ready to mix up a Hope Mule with organic lemons from a Southern California orchard? We’ve got the hard stuff covered! Green Hope was born the same way that any story worth telling was born – over vodka-filled nights with friends. We wanted to create a vodka that we can feel good about drinking – a vodka that you can drink as organically as you can eat. After mixing and matching ingredients, experimenting with our Master Distiller, and countless taste tests, we had just the right amount of liquid courage needed to make our vision become a reality. Join us on our journey to making vodka cleaner, fresher, and more pure… one cocktail at a time! We are proud to partner with the CCOFF, California Certified Organic Farming Foundation, and give back 1% of our sales. We find it of utmost importance to know where our grains come from before we distill them into our spirits. CCOF is a non profit organization that holds our same core values in organic farming, education and promotion. You’ve made a conscious decision to go organic when it comes to the foods you eat. Why not do the same with the spirits you drink? 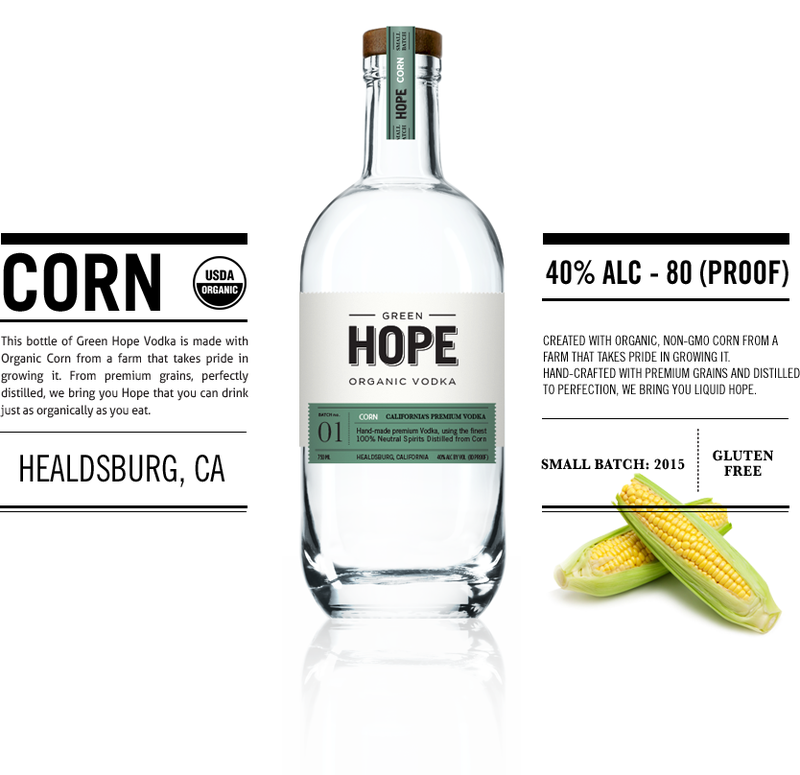 Hope Vodka is the fresh, clean alternative to commercial vodkas on the market made with GMO-grain. Whether it’s happy hour with the girls or a Saturday spent relaxing by the pool, a Strawberry Mint Sparkler infused with pure Hope Vodka is just what you need to top it off! This effervescent cocktail is just as sweet as it is sour – perfect for a warm spring or summer day. Juicy strawberries are combined with tart lime juice and mint in this light and beautiful cocktail. Next time you are at the farmers market, pick up some fresh local strawberries, limes, and mint leaves in order to craft your very own! Begin by combining strawberries and lime juice in a cocktail shaker, and muddle the mixture until the strawberries are completely dissolved. Add 10 mint leaves and tap five times with the muddler. Pour 2 ounces of Hope Cane Vodka to the shaker, fill it up 2/3 of the way with ice, and shake until chilled. Strain the mixture into a Collins glass filled with ice, add club soda, and stir gently. Don’t forget the mint, lime, or strawberry for garnish! Can’t get enough Hope Vodka? Subscribe to our newsletter for custom drink recipes, a behind-the-scenes look at our distilling process, and other exclusive content! Want to chat with us directly? Drop us a line at info@greenhopevodka.com and we’ll get back to you shortly.